Bovada used to be Bodog. Flying under the old Bodog flag, the site became the most popular legal online bookmaker destination for US bettors. With the guidance of billionaire Canadian entrepreneur Calvin Ayre, Bodog had exceptionally deep financial pockets to weather any type of betting run. The Morris Mohawk Gaming Group (MMGG) based in Kanhawake, Quebec, Canada now operates Bovada, continuing the tradition of deep financial backing. Legal licensing has been provided by one of the most recognized international online gambling license providers, and banking options are diverse as well as swift. Generous bonus and incentive packages are in place, and for many other reasons we cover below, this popular US-friendly online bookmaker bears our highest recommendation, and is undeniably one of the best USA online bookmakers on the Web. Betting lines, payouts and odds "better than Vegas"
Legal licensing is important to US sports bettors. That is because currently, American-based companies cannot legally offer Internet sports betting services to residents of the USA. The Kahnawake Gaming Commission (KGC) is recognized by the Canadian government as a registered online gambling license provider. Bovada obtained and maintains certified licensing with the KGC, which means that you are dealing with a legitimate business. Also, Bovada's entire Internet sports betting operation is delivered exclusively to United States sports bettors. The best legal online bookmakers offer convenient credit card account funding. That includes Bovada, the most popular US sportsbook found online. Visa credit, gift and debit card account funding is supported. Using your preferred plastic after an initial verification process as a new account holder, deposits hit your bankroll immediately and are available for wagering instantly. There are also rapid transfer and money transfer options available through Moneygram and Western Union. Withdrawals are processed within 48 hours, and there are several options here as well. Bovada understands that the majority of US sports bettors prefer a mobile bookmaker experience. You can still access your player account from a traditional desktop or laptop PC, but the responsive mobile sports betting app the company offers will quickly become your favorite way to access your account. Special software instantly delivers a display and user control panel which fits whatever sized screen you are on. This means access from your smartphone, tablet or other mobile PC is seamless. There is no bothersome and time-wasting download to undergo either. Also, the entire Bovada legal online bookmaker experience is available through your mobile access, not a watered-down version. Support is guaranteed for Android, Apple, BlackBerry and Windows Phone operating systems, and your bets are confirmed quickly thanks to blazing fast and frequently updated software. While we always recommend holding active accounts at several online bookmakers, that isn't usually a need with Bovada. The company has intelligently developed a reputation for posting early lines and odds that are much more generous and attractive than the Las Vegas line that most Internet sportsbooks set their opening numbers by. We still urge you to open and fund accounts at multiple legal online bookmakers. This will always give you the best possible betting numbers and payouts. Just know that Bovada is the standard in the industry when it comes to offering competitive lines and odds. Most sportsbooks will deliver either a free bet or deposit matching bonus to pad your bankroll. Bovada does this in the form of a generous 50% free bet bonus up to $250. For a working example, when you deposit $500 you receive a free bet credit for $250. Win that bet and you keep your winnings. Lose the bet and you lose nothing. Also, every time you get someone else to sign up and make a deposit, you can earn up to $100. 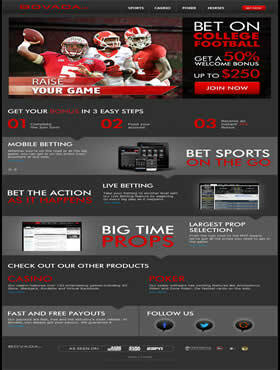 Bovada also offers special weekly, monthly and seasonal bookmaker bonuses, incentives and rewards. What Sports Can You Bet on, and What Types of Bets Can You Make? Bovada offers one of the widest varieties of sports to wager on of any legal online bookmaker. Of course, the biggest professional and college sports leagues are covered with NBA, MLB, NHL, NFL and NCAA action. But Bovada also covers all major US and international horse racing events, soccer, tennis, golf, boxing, and motor sport leagues. Rugby, cricket, darts and snooker are also represented, and you can even place wagers on politics, business deals, and reality television. As far as betting types, this online bookmaker allows you to place typical spread, side, total and money line wagers. But intricate teasers, pleasers, round robins and parlays are also accepted. Live in-game betting options are delivered for betting while the game is happening. The company will even post betting propositions which you make. If you do not see the type of bet you like, simply contact customer support and make a suggestion.